On 29th August bank holiday, the Harwich Redoubt had a free open day, so as I was in the area I thought I’d pop along. They were very accommodating, since I arrived unannounced, and gave me permission to record anywhere in the fort. It reminded me of Landguard Fort (where I did an artist residency in 2011), which resides on the opposite side of the water, both built to defend the harbour from any attacks or invasion. There were plenty of displays and activities for people to see and learn about the rich history of the fort and the people who had served there. 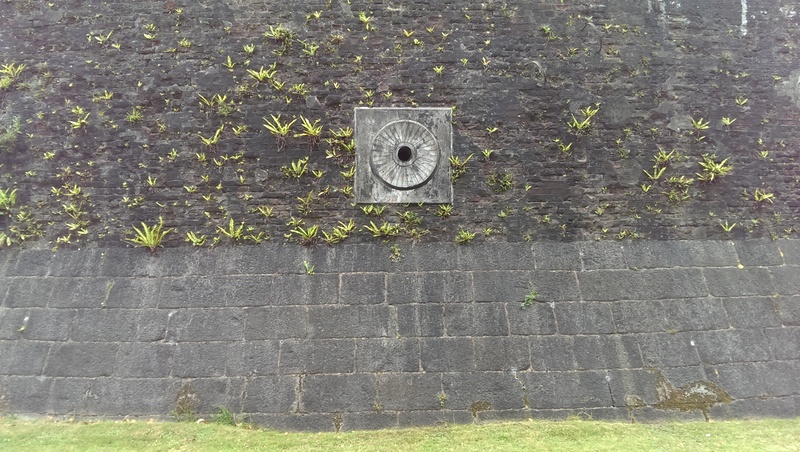 The soundscape was dominated by the ‘wheel of fortune’ and ‘rat up a drain pipe’ games, and the subtleties of the acoustics of the fort’s spaces were largely hidden. The most interesting space I found was the large moat which circles the whole building. Curiously, there was a triangle hanging on the wall way out of reach of anyone, and its use is still unknown to me now. Anyhow, the desire to know what it sounded like meant that I had to find an object to throw at it, and the best thing I could find was a small piece of a tree brand. Listen to discover if my aim was any good.